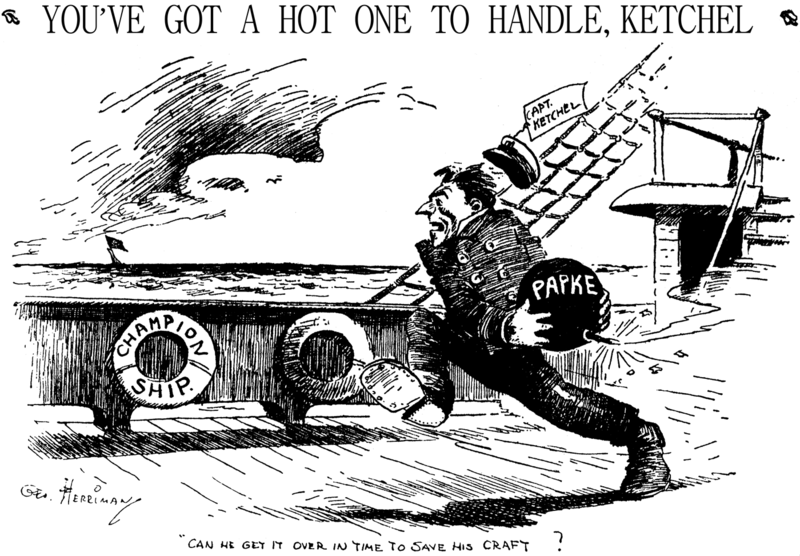 July 5 1909 -- Tonight champion middleweight fighter Stan Ketchel will face Billy Papke for the fourth time, looking to improve on his 2-1 record against the rival for the crown. He'll win again, this time in a 20-round decision. Sorry for the replacement headline text; the original was too bad off in the photocopy to be retained. I've never found fonts that quite match the lovely ones they were using in the Examiner in those days. 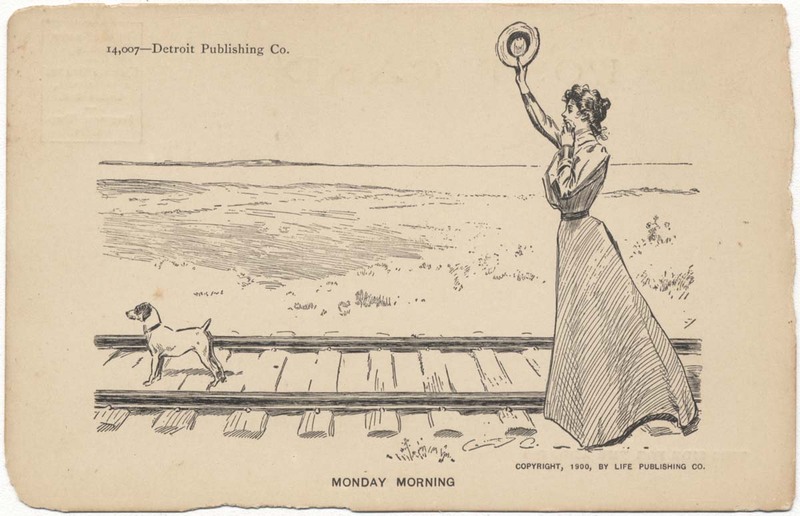 The Detroit Publishing Company, best known for their high-quality photo postcards, also dabbled in comic cards. But befitting their quality approach, they licensed images by Charles Dana Gibson, arguably the most famed illustrator/cartoonist of the era. Although the series displays copyrights from when the cartoons were originally printed in Life magazine, I am told this Detroit series was produced in 1907. It must have been early in the year since these are undivided back cards. This card is numbered 14,007. I have several of these, all of which have ratty edges. I wonder if these cards came in a booklet or something, and had to be torn out to be used individually? I don't think these were offered in a booklet or in a card of four that you'd cut out like the Hearst comic star postcards. Detroit was a top producer and it would seem unlikely to have cheapo cut-out offerings. However, these might have been something Detroit was commisioned by LIFE to make for them asa premium, and they had other ideas. Maybe a perusing of 1907 issues would have an ad for them. 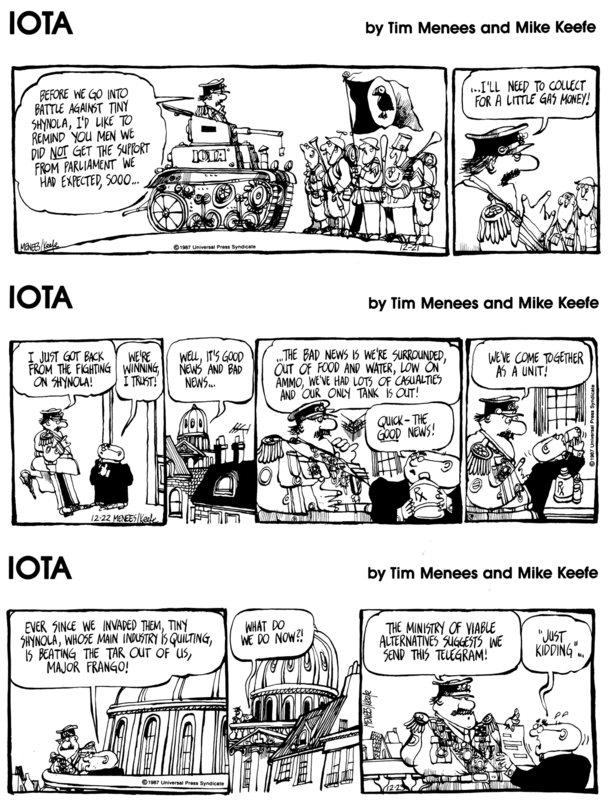 The editoonist team of Mike Keefe and Tim Menees had struck out with their first syndicated comic strip, Cooper, but less than a year later they were up at bat again. Universal Press gave the guys a second chance with Iota. The new strip went in a very different direction than Cooper, which had attempted to target the school teacher demographic. Iota eschewed the formula of targeting a specific readership segment, and instead offered a broad comedy about the hapless governance of a small island nation. The idea certainly had potential -- it was a constant subject for movies (Woody Allen's Bananas, the Marx Brothers' Duck Soup), novels (The Mouse That Roared) and even comic strips (Popeye's adventures in Nazilia) -- but perhaps by 1987 it had been overdone. Whether Menees and Keefe brought anything new to the party is debatable, but the strip certainly didn't find a lot of receptive newspaper feature editors, and it disappeared before its first anniversay. 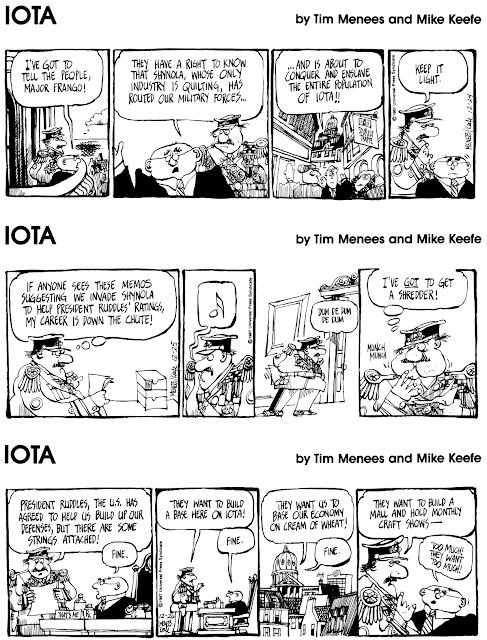 Iota ran from November 23 1987 to September 10 1988. George Edward Marcoux was born on April 11, 1896, in Waterbury, Connecticut, according to his World War I and II draft cards. In the 1900 U.S. Federal Census, Marcoux was the oldest of two sons born to John, a machinist, and Mary J. The family resided in Waterbury at 108 Maple Street. Marcoux was joined by three sisters and a paternal grandmother (twice widowed) in the 1910 census. The Marcoux family were Waterbury residents at 124 Locust Street. Marcoux has not yet been found in the 1920 census. The 1925 New York state census recorded Marcoux and two sisters, Evelyn and Florence, as lodgers in New York City at 365 West 116 Street. Marcoux and Evelyn were stenographers and Florence a saleslady. Newspaper artist Marcoux and his wife Anna were Brooklynites in the 1930 census. They lived at 256 East 37 Street. Information about Marcoux’s art training has not been found. 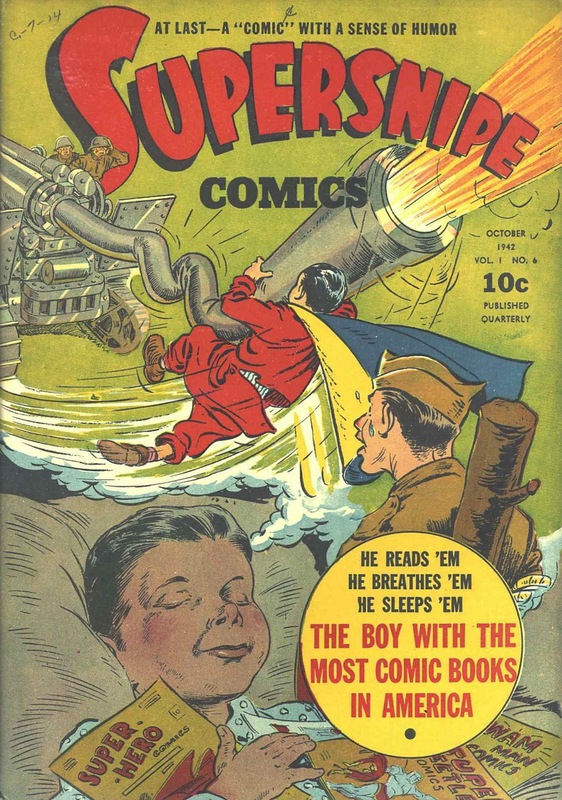 American Newspaper Comics (2012) said Marcoux assisted on Percy Crosby’s Skippy beginning in 1927 into the early 1930s. When cartoonist Harry Haenigsen’s took a month-long break, starting May 26, 1930, from his series, Marcoux, Joe Strauss and Al Smith filled in for him. 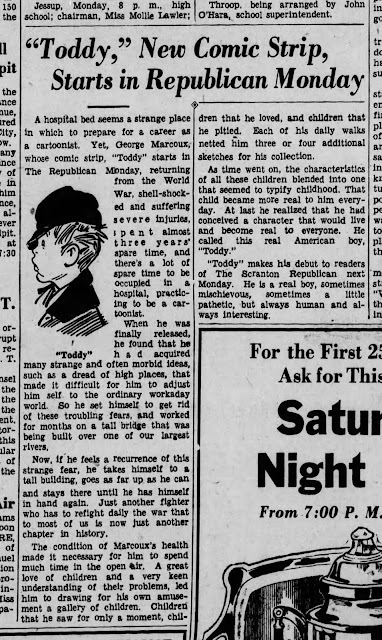 Marcoux created Toddy which ran from 1934 to February 25, 1939. It was distributed by the McNaught Syndicate. A few years later freelance artist Marcoux moved to Yonkers, New York according to the 1940 census. He and his wife made their home at 197 Valentine Lane. Marcoux’s highest level of education was one year of high school. 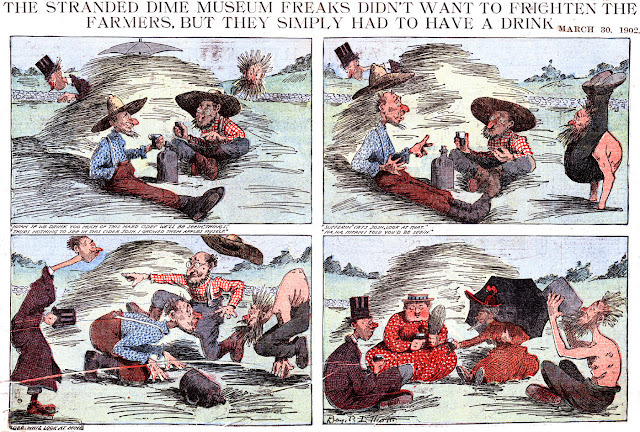 From around 1910 to 1920, Who’s Who of American Comic Books 1928–1999 said Marcoux contributed gag cartoons to Collier’s, Life, Parent’s Magazine and the Waterbury Republican, and was an animator. In the 1940s, Marcoux also found work in the comic book industry, mainly with publisher Street & Smith. Marcoux is best known for his creation Supersnipe. On April 26, 1942, self-employed cartoonist Marcoux signed his World War II draft card. His address was unchanged. Marcoux stood five feet six inches, weighed 150 pounds, had brown eyes and was bald. …died…of a heart attack in Naugatuck, Conn., where he had gone to visit his Summer home over the weekend. Mr. Marcoux…was engaged in freelance commercial art work. He also voluntarily taught art in the United States Veterans’ Hospital on Kingsbridge Road, the Bronx, in therapy programs there. For ten years Mr. Marcoux was creator of “Skippy,” another nationally syndicated comic strip. …He was chaplain of Yonkers Post, Veterans of Foreign Wars, for the last three years and formerly of the Rainbow Division veterans in Westchester County, who make their headquarters in White Plains. …Surviving besides his mother, are two sisters, Mrs. Daniel Gauvin, also of Ardsley, and the former Lillian Marcoux, wife of Dr. Neale Towne of Naugatuck, and one brother, John Bernard Marcoux of Waterbury. After a several year stint assisting Percy Crosby with his hugely popular Skippy comic strip, George Marcoux got the bright idea to create a somewhat similar 'kid' feature of his own. Marcoux's strip would straddle the thoughtful world of Skippy and the more rambunctious kid strips like Reg'lar Fellers, settling in somewhere pretty close to Edwina's Cap Stubbs and Tippie, gentle yet not cloying. McNaught Syndicate, which had no kid strips on offer at the time, accepted Marcoux's strip. Why they didn't suggest a different name than Toddy is beyond me -- do you really want to name a kid strip after an alcoholic drink? I doubt that the name is what kept Toddy from being a bigger success, but it seldom helps to make features editors conflicted over your offering like that. The earliest date I can find for Toddy's debut is on October 29 1934 (in the Scranton Republican), but the official start date could be a little earlier, since the strip made it into the 1934 E&P Syndicate Directory, issued in August. The strip evidently had enough clients to satisfy Marcoux and his syndicate, because it stuck around, and even gained a Sunday strip on August 1 1937. Toddy's demise came on February 25 1939, and some subscribing papers ran the explanation that it was discontinued due to illness of the artist. Perhaps that's true, or maybe Marcoux had found the grass greener in the new comic book industry. Marcoux is known to have started producing original material for comic books as least as early as 1940. In 1942 he created the fan-favorite character Supersnipe, which would cement his place in the comic book history hall of fame. Benjamin Pearson Elliott was born in August 1868, in Philadelphia, Pennsylvania. The birth information is based on the 1900 U.S. Federal Census. Elliott’s middle name was on his headstone. In the 1870 census, Elliott was the youngest of four children born to Joseph, a watchmaker, and Sallie. They lived in Philadelphia. The 1880 census said their address was 230 North 21st Street. Elliott’s education was mentioned in the Philadelphia Inquirer. The Inquirer June 27, 1883, reported the results of the examination for admission to the Philadelphia High School and Elliott was accepted. In the Inquirer, February 12, 1886, Elliott was named a meritorious pupil for “having attained term average of 85 or over, but less than 95”. Elliot was mentioned in the Annual Report of Acting President Hopper of the Central High School for the Year Ending December 31, 1887. Elliott received a Bachelor of Arts and a Teachers’ Certificate. Apparently Elliot’s first line of work was indexmaker* according to a listing in an 1890 Philadelphia city directory. His home was 230 North 21st Street. The 1895 directory said Elliott and his brother Charles worked with their father at the J.S. Elliott Company. The 1899 Boyd’s Co-partnership and Residence Business Directory of Philadelphia City said Elliott was the manager of J.S. Elliott Company. The 1900 census recorded Elliott, who wife, Bessie, and daughter, Sarah, in Philadelphia at 321 Wilton Street. His occupation was indexmaker. The same address and occupation were in the 1900 and 1901 city directories. So far the earliest record of Elliott the artist was found in The Quarterly Illustrator, April, May, June 1894, which published his ”Still Life”. This was his entry in the index, “Elliott, Benjamin P., 230 North 21st Street, Philadelphia, Pa……159”. The 1902 directory said Elliott was an artist with a studio at 514 Walnut Street. His home remained 230 North 21st Street. The Inquirer, February 16, 1902, covered the Philadelphia Sketch Club annual meeting and said Elliott was on the House Committee. American Newspaper Comics (2012) said Elliott drew Adventures of the Stranded Dime Museum Freaks for the North American Syndicate. It ran from March 9 to May 25, 1902. 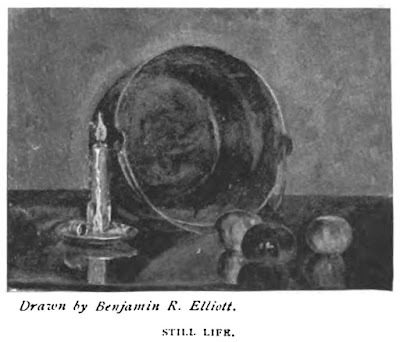 Elliott had two listings in the 1905 directory: “Benjamin Elliott” the clerk, and “Benjamin P. Elliott” the artist. The 1906 Boyd’s Philadelphia Blue Book included listings for the Philadelphia Sketch Club and among its active members was Elliott who was in Texarkana, Texas. The 1906 Texarkana, Arkansas and Texas, city directory said Elliott resided at 614 Olive Street and was a clerk with the T & F S Railway. According to the 1910 census, Elliott and his wife, Idalia, were residents of Texarkana, Arkansas at 1602 County Avenue. Elliott was an accountant with the railroad. The 1914 directory listed Elliott as a bookkeeper with the Southwest Gas and Electric Company. The entry in the 1917 directory said Elliott had moved to Corpus Christi, Texas. The 1920 census Elliott and his wife were in her father’s household in Texarkana, Arkansas. Thomas H. Davis was a carpenter with a wife and five children, including Idalia. Elliott operated his own grocery business. They all resided at 1109 County Avenue. City directories in the 1920s and 1930s listed Elliott and his wife as the operators of Elliott Grocery Shop at 1321 County Avenue. Elliott passed away September 2, 1936, in Texarkana. He was laid to rest at the State Line Cemetery. * What Is an Index? : A Few Notes on Indexes and Indexers (1878). Several issues of the Middlesex County Historical Society’s pamphlets said the society has a “Painting by Benjamin P. Elliott, who lived on the corner of Court and Pearl Streets, Middletown.” I have no record of Elliott residing in Middleton, Connecticut, but it can’t be ruled out. There was another artist named “Benjamin P. Elliott” who was listed in Bulletin of the American Art-Union, December 1, 1850. He resided in Providence, Rhode Island and perhaps once lived in Middleton.